Have you ever been stung by a wasp? If the answer is no, then count yourself lucky! For no insect inspires such fear and anxiety in the hearts of children and adults alike in the UK than that of the common wasp. Most active during the summer season, the female wasp uses her ‘ovipositor’ from which to lays eggs to equally impart a painful sting on those who threaten her. While these stingers do not pose any major danger to human life in the long run, they can be life threatening for people with allergies. What’s more, their tendency to set up camp in areas of human habitation such as wall cavities and roof spaces sometimes renders their control absolutely necessary for your safety! Of the 20,000 species of wasps, it is a small proportion of wasps who live in colonies, known as social wasps, who sting. When their nests are disturbed, they tend to behave in a mob manner and attack in large groups. The best method therefore to deal with them is to treat their nest within the early stages of the year, before their numbers increase. While this is one of the most efficient way of control for wasps, we highly recommend hiring a professional to do this. As the ancient Chinese philosopher Lao Tzu warned ‘there is no greater danger than underestimating your opponent’, and a D-I-Y nest treatment may leave you with a nasty bunch of stings you didn't bargained for! Although this has the potential of being very dangerous, it can be done safely using protective equipment to keep oneself safe from stings. At Pestforce, we advise that this should also be left to a professional to ensure your complete safety. 1. 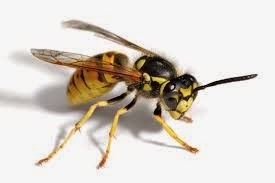 When treating wasps try not to squash them, as when dispatched through such a method, the insects give off a powerful chemical that signals other wasps in the area to attack! 2. Call a trained technician as early as you can! Wasps undoubtedly become more of a pain as the summer progresses, but they’re easier to get rid of in the spring and early summer, before their numbers multiply and their aggression heightens.